As we approach the first Pesach since New Israel Fund Australia was formed, we want to thank you for your principled commitment in supporting us and the New Israel Fund. 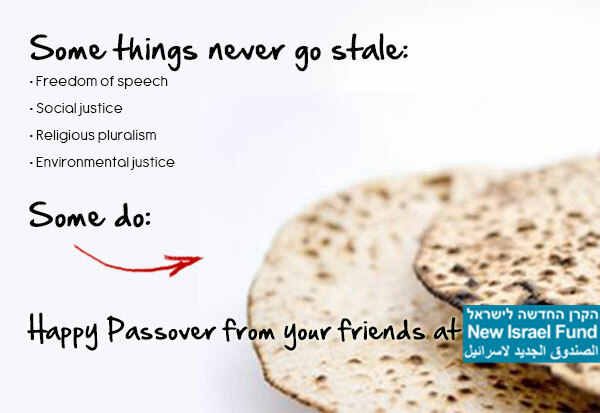 Pesach, the festival of freedom, provides an opportunity to reflect on NIF’s critical work upholding freedom: supporting the battle against gender segregation in public spaces; supporting Israeli Arabs to challenge discrimination and racism, most recently in response to mob violence directed at Arab workers in a Jerusalem mall; supporting disadvantaged Mizrachi and Ethiopian Jews; and advocating for other marginalised people in Israel, including people with disabilities, refugees and people struggling with homelessness or with poor access to education. We are also delighted to be able to announce that Daniel Sokatch, the chief executive of the New Israel Fund, will be visiting Australia in May for speaking engagements in Sydney and Melbourne. Daniel is an inspirational speaker and his visit will give you the opportunity to get a better understanding of the range of organisations NIF supports, why the need for NIF’s work is more urgent than ever, and to ask any questions you have about NIF. You can read a message from Daniel here. Details of Daniel’s trip will be made available nearer the time. As you sit with family and friends at the seder table, you may like to add to your reading of the haggadah some of the following material, which shines contemporary light on the Jewish tradition of social obligation, brought to life each year in the re-telling of our ancient story of the Exodus. The Uri L'Tzedek Food and Justice Haggadah Supplement features essays, insights and action to unite food, social justice, and ethical consumption. The haggadah used in the Fifth Annual Seder for Israelis and Refugees in Levinsky Park: A Celebration of Freedom. "Go ahead, be Jewish the way you want." Please subscribe to our newsletter so that you keep up to date with all our announcements regarding Daniel. We acknowledge the traditional custodians of the land on which our offices stand and we pay our respects to Elders past, present and emerging. We acknowledge the sorrow of the Stolen Generations and the impacts of colonisation on Aboriginal and Torres Strait Islander peoples. We also recognise the resilience, strength and pride of the Aboriginal and Torres Strait Islander communities. Aboriginal and Torres Strait Islander peoples should be aware that this website may contain images or names of people who have since passed away. New Israel Fund Australia (ABN 70 151 140 377) is registered as a public benevolent institution with the Australian Charities and Not-for-profits Commission. All donations over $2 are tax deductible.